Of course we know who to blame for the current crisis: bankers, developers, politicians. Or do we? What if we've got it the wrong way round? After all: who took out the sub-prime loans in the United States, or the buy-to-let mortgages here in Ireland? I know, it's a bit rich blaming those now 'upside down' with their mortgages when the bankers who loaned the money are getting bailed out by taxpayers on both sides of the Atlantic. But it's worth further consideration: what were people thinking when they took out sub-prime mortgages in the United States when they didn't even have a job or income to meet the repayments? We know what the people who loaned them the money were thinking: bonuses. But really: how did people think the biggest housing bubble in history was going to end - with a slow imperceptible hiss? The proportion of buy-to-let mortgages in total residential mortgages has been increasing over time, reaching 26% in 2007 and accounting for almost half of all new homes bought in the last two years. The rental market has expanded from 16% of total housing units in 2000 to 21% in 2006. The growth in the number of second or vacant dwellings has added to the boom in the housing sector. The share of vacant dwellings in total housing increased from 10.5% in 1996 to 16.7% in 2006. The biggest class of vacant habitable dwellings in the "other" category are dwellings held for investment purposes. So should the homeowners and private investors who bought at the peak be bailed out? Whether sub-prime in the US or buy-to-let in Ireland? If they're bailing out the banks then why not bail the borrowers? Of course this raises serious moral issues. 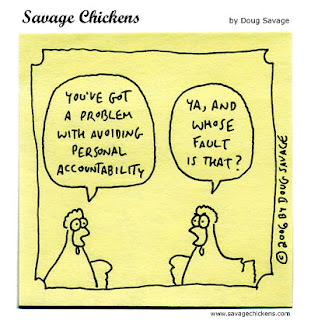 After all, where does personal responsibility begin and end in relation to people's financial decisions? It isn't an easy one, as this debate over at the brilliant In Character journal illustrates. And will our methadone housing policies only make matters worse? In short, we're learning the hard way that virtues like prudence, temperance, thrift, promise-keeping, honesty, and humility - not to mention a willingness not to do to others what we wouldn't want them to do to us - can't be optional-extras in communities that value economic freedom. If markets are going to work and appropriate limits on government power maintained, then society requires substantial reserves of moral capital. We have to be honest with others, but we also have to be honest with ourselves. As Charles Haughey once put it during an earlier economic crisis - quoting Walt Kelly - 'we have met the enemy, and the enemy is us'. Fine by me, I didn't indulge in the feeding frenzy. I'll sure as hell be keeping my eye out for some upcoming bargains in the next 18 months though. Heres a bargain for you..
MADRID (AFP) - A Spanish property developer is giving away two homes for the price of one in a bid to find takers on the collapsed market. According to El Pais newspaper, the developer is giving away a one bedroom apartment with every townhouse it sells. The four-bedroom town-houses are located near the beach in Terrazas de Miraflores in Andalusia province. "Buy a town-house in Terrazas de Miraflores and get another one-room apartment in Baviera Golf," the Salsa Immobiliaria company says on its website below a photo of the town-houses surrounding a swimming pool.